I’ve taken this week off to work on my upstairs bathroom and generally get ready for Halloween. Historically this has been the busiest week in our house with three young kids, as many costumes and parties, and a ton of others things to be done. I decided to take off some time to be home given I’m not traveling much this semester, which has increased my quality of life 1000 fold. Anyway, on Wednesday morning I got up with the two older kids and got them off to school, and then took some time to walk Tommaso to his preschool downtown. He has gotten into the habit of scootering to school with the requisite stop at the local cafe for his favorite pastry (as Dr Garcia would say, “Eurobaby!”). 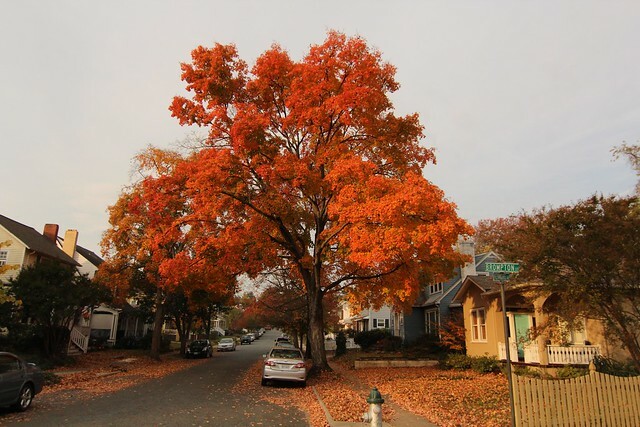 I figured I would take a camera given Fall is pretty decadent in Fredericksburg this week. Less than a block from my house is a big old beautiful tree that is basic on fire. I see it from my front door on a regular basis, but I decided to try and capture the image, so I did. 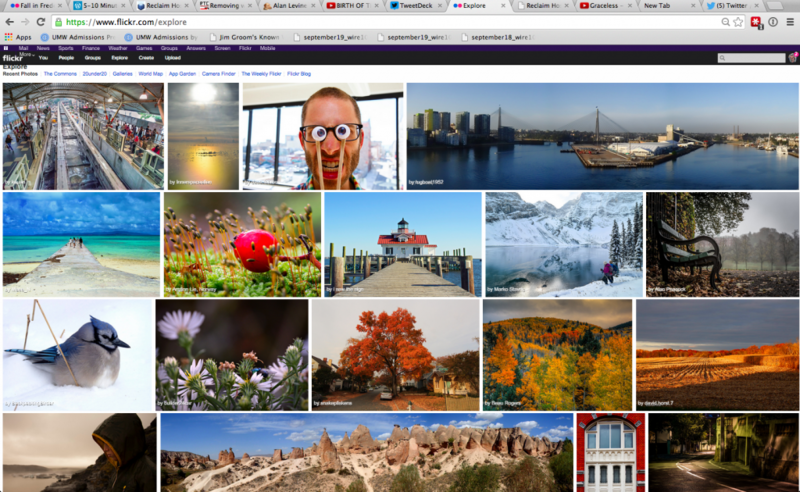 @jimgroom Yup…click on the explore tab from your flickr stream. Third row down. There is an algorithm. It probably started off measuring all the obvious things but certain groups got really good at gaming the system so Eric built in some less obvious criteria. The objective is not to find the best pictures on Flickr (impossible for anyone to agree what they might be) or even the most popular (though the algorithm takes note of popularity as some indication of something), but simply to highlight interesting content that you might not otherwise see. I just love the idea that the algorithim is trying to resist the idea of the best or most popular photo, and focusing on this idea of interest–whatever that means. It’s not a competition, but getting featured like this does make me feel kinda good. Being featured can easily be seen as a competition, and I understand why, but if it’s framed around one’s interest it can become a far more interesting and generative process of building community. I’m particularly taken by this because just last week we ramped up the presence of ds106 inspire, a site where students feature the work other have done in the community that has inspired them. And that’s not necessarily about the best work, in fact ds106 has never been about the best work per se, but about finding ways to express and articulate your interests across various media. The students that frame, develop and more fully articulate their specific interests usually have the most fun. There’s something to that, and I kinda like that my tree photo found an audience on Flickr not so much that is was masterful composition or technically brilliant, but that some folks found it interesting. It spoke to their own sense of nostalgia for a moment. That simple connection beyond competition. It’s a fine line, but one worth exploring to build community. This entry was posted in digital storytelling, pictures and tagged ds106, Flickr, in[SPIRE], photos. Bookmark the permalink. When I saw 1400+ views in a day I went digging to find out why and found the Explore. Big Huge Labs help me find it http://bighugelabs.com/scout.php?